"Two of his books, 'The Family' and 'Tales of Beatnik Glory' are under option to be made into movies." I checked Imdb and found a title in development- "The Family" scheduled for 2014 but you need Imdb Pro to get any information, of which I am not a member. So I have no idea if this is related or not..if someone else has access, we would appreciate any info. This is a guy i'd love to sit in a room with and discuss this case....bet theres alot of interesting stuff that didn't make it into his book. I've heard better banjo players. hey Lynyrd, sorry to sidetrack, but I miss Katie. I never made it to her blog, can you post the address again. AND Carol, gave you give us an update on how Guinn's book is selling. Is it just me or have we lost allot of the women from this site? We need to get Bobby to throw some of his charm around and get em back. Who knew Sanders partied with those type dudes in his day?? For sure he has some tales to tell about many things relevant to those times. 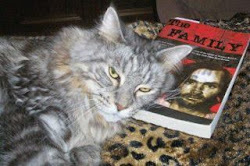 Kimchi, Thanks for the post, I would like to be a FUG fan but he is a bit over my head. Still very interesting and again thanks for posting. Bobby. Hey what the heck, I missed Katie but I also must have missed the part where she is gone and has a blog ? "He looks like Jerry Garica and Albert Einsteins third brother..."
"Kimchi, Thanks for the post, I would like to be a FUG fan but he is a bit over my head." Bobby, it's over my head too! Thank goodness, I'm in good company. LOL. It took me a while to get Cassady's joke too. The chicks dig puppy's right ? my cat of 15 years just passed away so I got this new puppie and have decided to go with it for awhile..
Ah man, I didn't know. I have been around long enough to have buried Cat's & Dog's so I know how tuff it is. And you will have always been a Saint in my eye's , St.
That sounds wrong "will have" I meant you just have been a St. in my eye's. LOL. "He looks like Jerry Garcia and Albert Einsteins third brother..."
That was freakin' hilarious Saint. That's the best joke, I've heard in a while. Sorry to hear about your dog Saint. I'm here, I just didn't post anything because I've only read parts of Sanders book and Vimeo vids won't play in my browser, never have been able to figure out why. Damn Kimchi....12th! That astounds me. I never thought it would break the top 50. But then what other criminal has Charlie's charisma and nutiness. I just personally thought the book was intensely disappointing. I thought you said, that you had lost your dog after 15 years... and replaced it with another. I see now, that you lost your cat. It was an honest mix-up. Seems like this one had a good director & actor lined up. I wonder why this one never got made. It's kinda hard to picture what sander's book would be like as a movie though. I did look into the film "The Family" directed by Scott Kosar. There are a number of stories about it online, unfortunately, nearly all of them are dated around Oct. 29, 2010. One of them can be found HERE. Another story about the film dated Oct. 31, 2010 says it will shoot "next year". It can be found HERE. If or when that movie is ever going to be a reality, I don't know.